Currently students in Nunatsiavut are under the jurisdiction of the provincial school system. They have the same textbooks and curriculum as all the other students in the province. That curriculum contains absolutely nothing about the Inuit culture, language or history. As stipulated in their Land Claim Agreement, Nunatsiavut was granted the right to create an education system for students from K-12. Currently the Nunatsiavut Department of Education and Economic Development says that it is reviewing curriculum to see its strength and weaknesses as their first step to assuming these responsibilities. 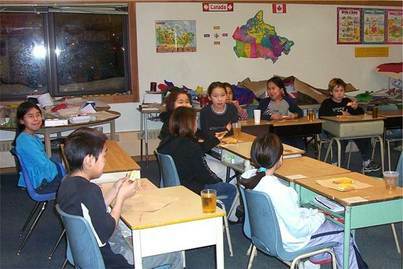 Primary school students at a school in Nain, Nunatsiavut. There has been no timeline provided nor has an official date been given for when they plan on taking on these responsibilities. Nor has any information been given about any potential discussions taking place between Nunatsiavut and the Government of Newfoundland and Labrador. These discussions are necessary to move forward with organizing and implementing curriculum. Discussions and planning are necessary to move forward with organizing and implementing any curriculum changes.